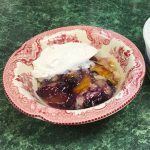 Grandmother’s Easy Peach Cobbler with Blueberries is a gluten free recipe by contributing author, Jane Scott. 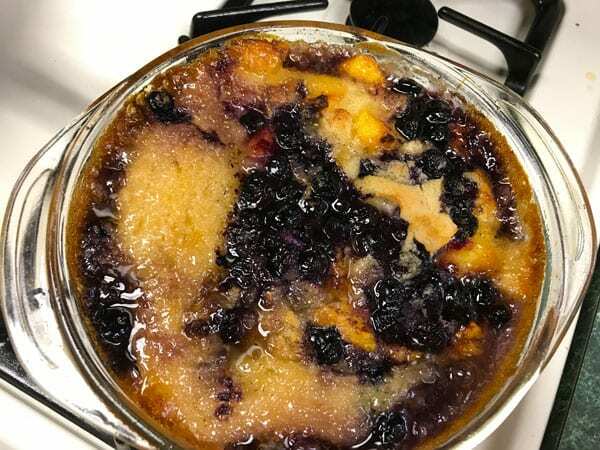 My Mother Dorothy, Lise Ode’s Grandmother, baked an easy 3-step fruit cobbler that I really liked. So, I converted it to be gluten free and dairy free. I chose peaches as they’re in season. I found some nice juicy ones and let them ripen fully on the kitchen windowsill in a paper sack. Using really ripe peaches is the key to having the peach juice needed to dissolve the sugar. 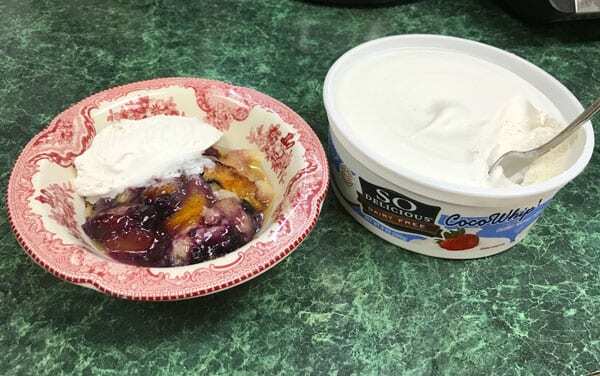 I also used blueberries in addition to the peaches as Dorothy did that. 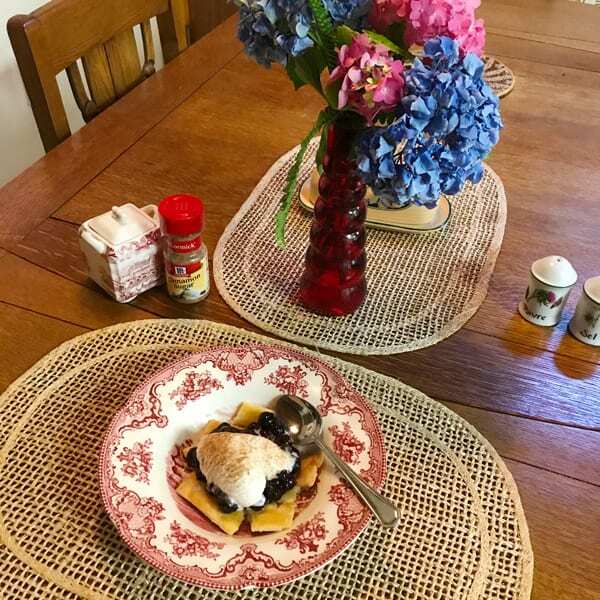 I baked this Grandmother’s Easy Peach Cobbler with Blueberries recipe multiple times using different flour mixes each time. I found the Paleo flour the best as the batter wasn’t too thin and it has ingredients that most folks can tolerate. Baking in a 10 x 10 square baking dish helps brown the cobbler more evenly. Gluten free recipes don’t brown as readily as regular flour recipes. Using a higher temperature of 400°F worked better as well (350°F is in the original recipe). As I wanted to use Dorothy’s original deeper 1 qt. round Pyrex dish, I tried placing it higher in my oven and that was the key to having it brown on top in that dish. So, I baked it on the middle rack for 40 minutes in order that the bottom could cook and then for the last 20 minutes on the top rack for the top to brown. Baking gluten free is a different process taking patience and forethought to be successful. Not all gluten free flours will work for different baking dishes. Thus it’s a totally new learning experience. 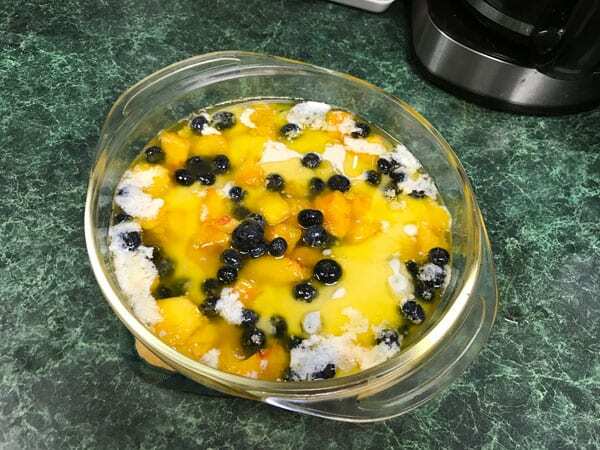 I hope you enjoy Grandmother’s Easy Peach Cobbler with Blueberries. Let us know if you try it by leaving a comment below or sharing a photo to Instagram and tagging @momlovesbaking. Read more about Jane Scott on our Meet the Team page. A gluten free version of a treasured family recipe for peach cobbler with blueberries. Preheat oven to 400°F. 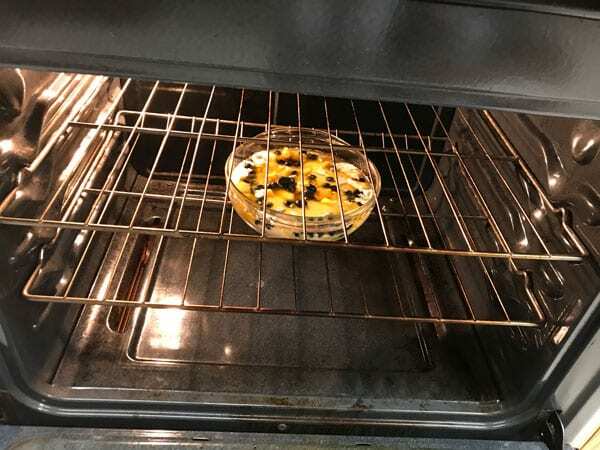 Melt butter or margarine in a Pyrex 1.5-Quart Glass Bakeware Dish in oven while it’s heating up. 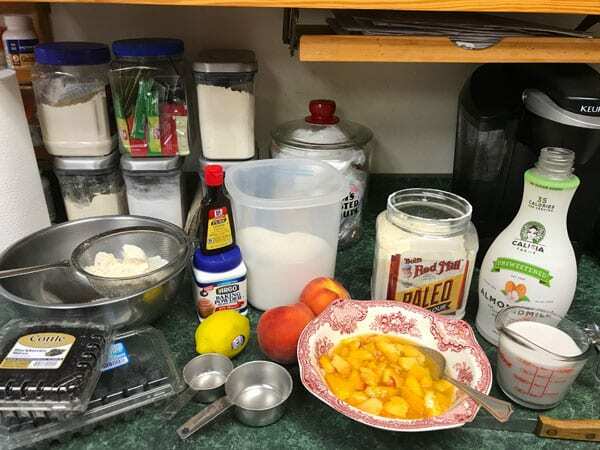 For the fruit: In a medium bowl, mix sugar in with cut-up peaches and 2 tsp. lemon flavoring and let it sit to dissolve the sugar in the peach juice stirring occasionally then adding the berries when the sugar has mostly dissolved. For the batter: In a medium bowl, sift together 1/4 c. sugar, 1 cup Paleo flour and 1 1/2 teaspoons baking powder (if you want it to be less sweet, don't add the sugar here). Then add the milk gradually stirring until mixed. 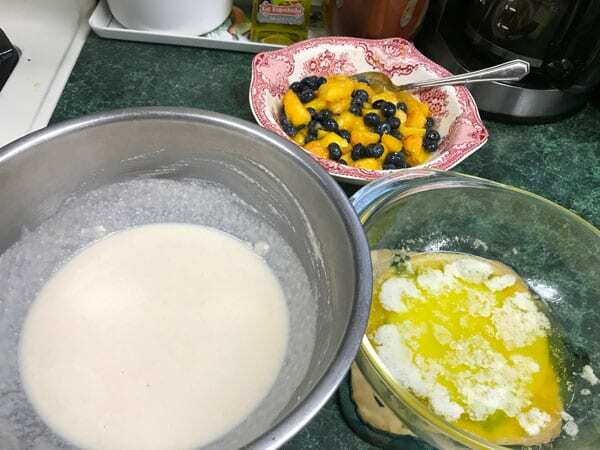 Add half the fruit to the baking dish with melted butter, next add the batter, and top off with the rest of the fruit. Put the cobbler dish on the middle rack and set the timer for 40 minutes. Replace the cobbler on the top rack and reset timer for 20 minutes. Add additional time if needed for browning the top of cobbler batter in your oven. You might also like Grandmother’s Quick Easy Blueberry Pie. 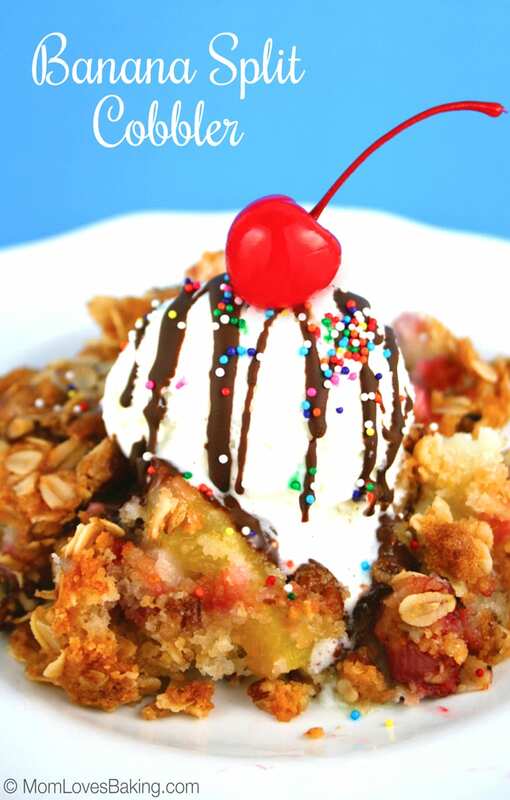 Or maybe you would like this Banana Split Cobbler (please note that it’s not gluten free). Mmm, love peach cobbler! Peaches always remind me of my grandmother. She was a Georgia girl!